Renovated Oceanfront Penthouse Condo with Pool and Hot Tub! Providing Sunrise and Sunset Views! This spacious Penthouse Condo provides breathtaking views from the wrap around oceanfront balcony. You can even see the Bay from the side balcony and enjoy sunset views and fireworks! The great room and master bedroom feature a wall of windows and sliding glass doors that lead out to the huge balcony. Here you will enjoy watching the Gulf of Mexico and the beautiful sunrises that await you daily! The balcony is the perfect place to start your day with a freshly brewed cup of coffee or to relax with a margarita at the end of a day on the beach! This condo is an end Penthouse unit providing you with more privacy, windows and balcony space for enjoying the incredible oceanfront views! The condo has been completely renovated in 2015 with all the modern touches. The great room has a Queen size sleeper sofa and side chair with ottoman. In addition there is a "game" table set up with extra seating and its in the perfect spot to enjoy the sunsets and fireworks over the bay in the summer season. 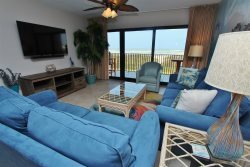 You will enjoy spectacular views of the Gulf and the beach from the comforts of the sofa while you enjoy the large screen TV with Cable and HBO. There is also a Blu-Ray DVD player if you plan to rent or bring movies with you and in addition there are a ton of movies provided for adults and kids. Wireless internet is provided. While preparing your daily meals in the fully equipped kitchen featuring beautiful granite countertops, you will be able to enjoy the breathtaking views of the ocean out the great room’s wall of windows! There is seating at the kitchen bar for a quick bite to eat and seating for up to 10 at the dining room table. Please note, we keep 8 chairs at the table, but there is a leaf that can be added to seat 10. The leaf is located in the Master Suite. There are three bedrooms and three baths in the condo. If you choose to lounge in bed for a late relaxing morning you will enjoy watching the ocean out of every window in the master suite which features a king size bed and a private bathroom with granite countertops and large shower. The King size bed features a brand new Memory Foam mattress. One guest bedroom has a Queen bed with a brand new Memory Foam mattress. The other guest bedroom features a Full size bed with a Twin bunk over top. In addition this guest bedroom has a Twin sleeper sofa. You should have plenty of sleeping space for your family. Both guest bedrooms have direct access to a full size bathroom with showers. All bedrooms come with LCD TVs. After a fun day on the beach, you can relax in the evening and enjoy the beach and Gulf from your front balcony or from the balcony off the back side of the condo you can watch the sunset over the Laguna Madre! The views can’t be beat at this South Padre Island Penthouse Condo. Seabreeze 1 Condominiums have beautifully landscaped grounds with a pool and hot tub for your enjoyment! Please come enjoy all that South Padre Island has to offer in this fantastic oceanfront condo. This is the perfect year round vacation spot with our tropical climate and being oceanfront you will enjoy the views from inside and outside this home! All units are completely furnished and fully equipped with linens, cooking utensils, dinnerware, washer/dryer, cable television in each room, iron/ironing board, and wireless internet. Seabreeze 1 also provides reserved parking and a centrally located elevator for your convenience. Although most units share the same floor plan, all units are unique in style and design. Therefore, Seabreeze 1 offers different bed arrangements to accommodate your needs. Beach umbrella and chair rentals are available through Ocean Kissed Rentals. You can rent directly on the beach or set up advanced reservations by calling Travis at 956-433-3420. The management team lead by Solia is a pleasure to deal with. They are friendly and always have something positive to say. Their availability and response is beyond reproach. The maintenance man Robert knows his stuff and is always prompt and helpful. The cleaning lady goes beyond expectations. Very relaxing to listen to the waves break from the unit. The view is amazing and we will be back. This is our 10th year and we plan on returning next year. What a wonderful place and the feeling of security is great.